I'm a loyal customer of Big Fish Games, but have experienced (for the first time) a Norton Security issue with the installation of a game after purchase. The issue raised is with SONAR.AM.C!G24, and Norton recommends I don't proceed with the installation. Big Fish say this is a false positive and that all their games are virus-free, but I'm really reluctant to proceed in case I end up compromising my security. Can anyone help? For more information re event > from Norton pop-up > More Details > Copy to Clipboard and/or from Norton history > More Options > Copy to Clipboard > paste. Which game is giving the false positive? Are you downloading via the BF game app or direct from BF website? I play BF games & never had a problem, I was just curious. Grim Tales: The White Lady - it installed and played the demo without issue, but when I bought it, it gets as far as the installation stage and then flags the SONAR issue. Thanks for reporting an issue in Norton Community Forums. Please submit the file to Report a Suspected Erroneous Detection (False Positive) and share the submission tracking number with us for further investigation. I am having the same issue with the same game. 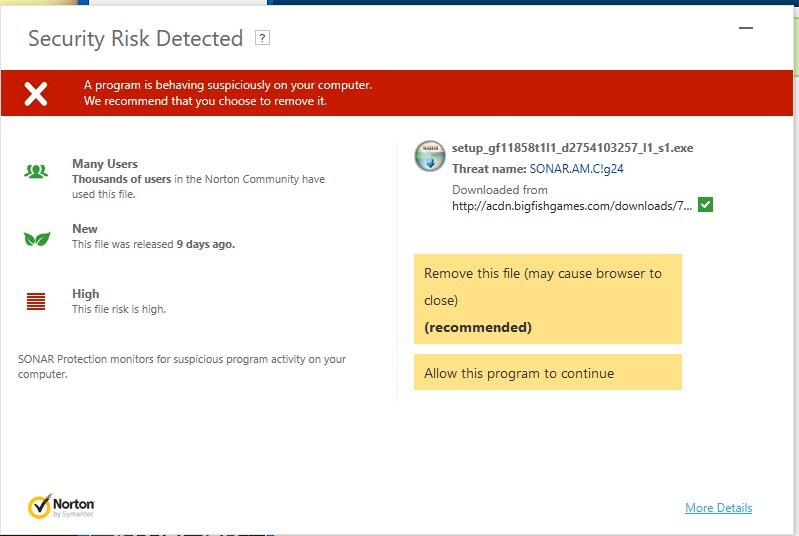 I get the error when the Big Fish installer attempts to install the game.I attempted to complete the False Positive report, but it requires you upload the file, and Norton prevents the installation, so I don't have a file to upload. Big Fish forums are still stating this is a problem with Norton and their games are guaranteed virus free. Is there any more news on this? do you have direct download URL? Or, temp turn off Auto-Protect. Can you download file? meaning file is Quarantined or Blocked ? I don't know the direct download url, it's done via the big fish ap. I have attached a text file of the error. I'm having the same issue in completing the False Positive report. I'm also still awaiting further help from Big Fish - they've tried to help with another issue that's happened at the same time (with loading my Purchase History), but their help for that hasn't worked either! Your submission has been received and will be reviewed. We endeavor to respond to all submissions within 2 working days. Karen Wood 24: I'm having the same issue in completing the False Positive report. In relation to submission 45263. In relation to submission 45268. In relation to submission 45281. I just want to thank everyone, especially bjm for help in getting this matter resolved. I installed the game, and all seems to work well. I really appreciate the fast response from Symantec Security too. And, I'd much rather be safe than sorry. I was really hoping to be able to say that I had the game running too but I'm still having issues with my Purchase History which I'm trying to resolve. Thanks everyone, especially bjm, for your help. I agree with Carolyn - I don't want to needlessly compromise my security.